The Democrats say they were duped. When confronted with the fact that their organization sent out a volunteer request for a Republican candidate, Georgia Young Democrats Executive Vice President Steve Golden said, "I believed him to be a Democrat." The "him" Steve Golden refers to is, of course, Public Service Commission (PSC) candidate Lance Robertson. As I highlighted Monday, Lance Robertson claims to be a Republican. However, actions speak louder than words; and Lance Robertson's actions proclaim unequivocally that he is indeed a Democrat running in the Republican primary. Robertson's campaign slogan is "Give Lance a Chance," and the Democrats are doing just that. The Democrats are giving Lance a chance to cause chaos in the GOP. The Gwinnett County Democratic Party touted a visit from PSC candidate Lance Robertson to their December breakfast (pictured right). 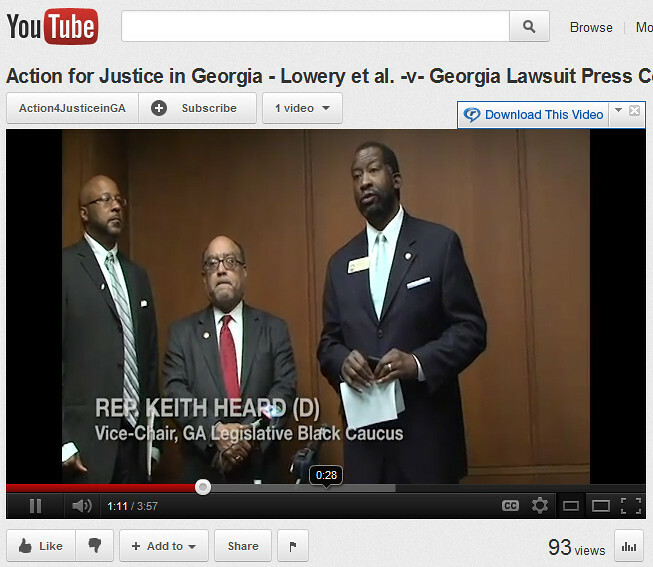 In a YouTube video posted on March 29, 2011 (screenshot pictured below, left), Lance Robertson can be clearly seen standing alongside two Democrats --state Senator Vincent Fort and state Representative Keith Heard-- as the Georgia Legislative Black Caucus announced a lawsuit [Joseph Lowery, et al., v. Nathan Deal] seeking to dissolve the Republican-leaning cities of Sandy Springs, Chattahoochee Hills, Dunwoody, Milton, and Johns Creek. Robertson was even described by the news media as a "spokesman for the Plaintiffs" in this legal action. Now I think it's very important to note that the plaintiffs in Joseph Lowery, et al., v. Nathan Deal are all Democrats. Joseph Lowery is a huge supporter of Democrat Barack Obama. The Georgia Legislative Black Caucus (GLBC) has no Republican members. The GLBC is an unofficial extension of the Democratic Party in Georgia. The Democrats would have you believe they were all duped by Lance Robertson. The Democrats want you to believe that Lance Robertson not only fooled the Young Democrats, he also fooled the Gwinnett Democrats, Joseph Lowery, and the Georgia Legislative Black Caucus. But remember folks, this is the Democratic Party. These people are very smart and they are very persuasive. After all, it does take both smarts and persuasiveness to organize Democrat voters into crossing over and participating in the Michigan Republican presidential primary so as to produce a weak GOP nominee. So allow me to call on Occam's razor once again. Occam's razor says all things equal, the simplest explanation is usually the correct one. Which is the simplest explanation? That Public Service Commission candidate Lance Robertson duped the Gwinnett Democrats, the Young Democrats, the Georgia Legislative Black Caucus, and even civil rights legend Joseph Lowery? Or that there's a conspiracy afoot to get a Democrat nominated in the July Republican primary?